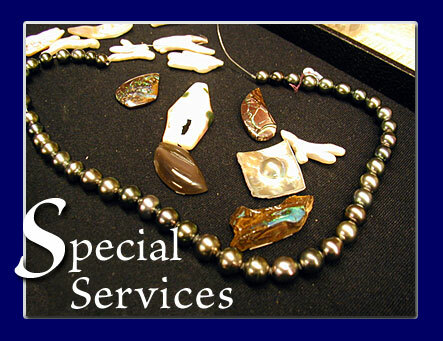 Untarnished Jewelry Of Manistee offers you your own "personal" jeweler. Steven Blank, owner, is a gold smith, platinum smith, gemologist, and diamond setter. He is the only full service jewelry store on wheels, serving customers at their convenience-time and place. Steve specializes in "one of a kind" custom gold, palladium, and platinum jewelry but also supplies classic items for weddings and engagements: necklaces, bracelets, earrings, belly rings, toe rings and right hand rings, etc. He has a large selection of gem quality stones including diamonds, rubies, emeralds and opals, plus multicolored sapphires, He can refurbish old jewelry along with cleaning and repairing modern jewelry. He offers full service at no additional cost, giving his customers exceptional quality and good, honest advice with their jewelry needs.